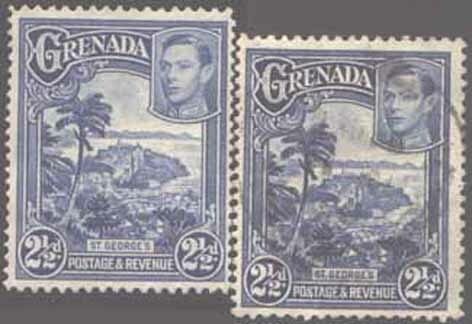 The 2½d bright blue exists with perforation 12½x13½. This is rare mint and scarce used. SG list it (SG157a) at £4,500 mint and £225 used. (The common version sg157 is perf 12½ and worth very little – cat 30p). We were offered the rare unused one recently. It was a forgery. This forgery and a genuine used SG157a (which we have in our stock) are shown below. · The shade is wrong, the blue being much lighter. · It appears to be line perf rather than comb perf. · The perf gauge is wrong – see how the side perfs line up at the base but drift out of alignment toward the top. · While both Gibbons and Scott catalogues list the side perfs as 13½ it is actually perf 13¼ (as shown in the Murray Payne KG6 Commonwealth catalogue). This forgery is perf 13¾ at the sides. · Basically is a normal cheap 2½d which has been cut down and reperforated at the sides. That is why the top left corner perforation shows line perf characteristics whereas the genuine comb perfs meet neatly at the corners. At the time of writing the genuine used one is available for sale. Please contact us for details.